How will Jerry Brown’s time in Oakland influence him as governor? Jerry Brown will be no stranger to Sacramento when he’s inaugurated as the governor of California this January. Much has been made of the now 72-year-old’s status as the state’s youngest and oldest governor, riffing on Brown’s first go at the governorship in 1974. But if the state capitol knows the early stages of Brown’s political career, the most recent show of Brown’s style as an executive took place in Oakland, where he was mayor from 1999 until 2006, before moving on to serve as California’s Attorney General and then running for governor again. Brown rode into Oakland politics on a wave of popularity. In his first mayoral campaign he took on a field of ten other candidates, but former governor Brown—the biggest name—won the primary outright, with no need for a run-off. During the November election of that year, voters passed Measure X, or the “strong mayor” measure, which took the mayor out of the city council and made him the chief executive of Oakland. Campaigning on a platform that emphasized the arts and downtown revitalization, Brown pledged to bring 10,000 people to live in the city center (the idea was informally dubbed the “10K plan”), and within his first two months in office stacked a newly formed education commission with his former mayoral rivals in an effort to revamp Oakland schools. Whether he succeeded or failed in these efforts—and the criticism, praise and ambivalence he drew from Oakland residents in response—could shed light on what’s in store for California with Brown as its next governor. Brown was not available to comment on how his time in Oakland may influence how he governs the state—his staff explained that he had gone on vacation when reporting for this story began, and that after returning he had too many interview requests to respond to this one. But the governor-elect’s friends and supporters say that because of his time in Oakland, Brown understands the nitty-gritty of urban politics like few other governors. Supporters hope this experience will influence Brown’s actions in Sacramento. “I think it is phenomenal that California is going to have a governor that has been the mayor of Oakland, who understands the constraints that we have with so many responsibilities and so little funding,” said Libby Schaaf, who served as a policy analyst to Brown in the middle of his mayorship and was just elected as Jean Quan’s successor to Oakland’s District 4 council seat. This fall, Brown ran for governor on a platform of job creation and reforming the public sector, but he also played up age and experience as selling points. Meg Whitman also trumpeted new jobs and pension reform, but although she tried to portray the wizened Brown as a “failed” politician, he won the election by 12 points. So far, Brown seems to be treating Oakland as his home base. The morning after the election, he held his first press conference as governor-elect in a Jack London Square warehouse, around the corner from the loft space where he lived in the mid-1990s when he first came to Oakland. While talking pension reform and the state budget, Brown also said he intended to keep his Oakland hills home where he currently lives with Anne Gust, his wife of five years who is the former general counsel for the Gap. Instead of finding a permanent residence in Sacramento, Brown will stay a registered voter in Oakland and find a place to stay in the state capital, according to his spokesman Sterling Clifford. Even during his first term as governor in 1974, Brown stayed out of the governor’s mansion and lived a freewheeling bachelor’s life in the public eye, dating singer Linda Ronstadt and trying “to close down the bars in Sacramento,” as Brown himself said in his first gubernatorial debate in 2010. In the 1990s, he brought his hip lifestyle to Oakland, hosting a sort of philosopher’s club called the Oakland Table in his loft space during the first years of his mayoral term. Brown later moved to the Sears Lofts on 27th Street and Telegraph Avenue, just north of the Uptown district he sought to restore. “I think he was connected to kind of the working class Oakland,” said his former public relations chief, Erica Harrold. As the son of an influential political family (his father Pat Brown was California’s governor from 1959 to 1967, and his sister Kathleen Brown was California State Treasurer from 1991 to 1995), Brown stood to gain from the perception that he was one of “the people.” In 1995, the New York Times reported that it cost Brown $1.2 million to build his warehouse on Harrison Street near Jack London Square, creating a commune where members shared meals and earned rent by helping to improve the facility and producing Brown’s call-in radio show that aired on KPFA. Brown used his WeThePeople.org website to promote the ideas that would shape his mayoral campaign. But reviews from the people of Oakland were mixed throughout his tenure, as Brown’s vision for revitalizing Oakland faced a sluggish real estate market and a city with a chronic budget deficit. Complaints rolled in that Brown was leaving ethnic minorities and the working class behind in favor of white professionals, and that he was developing the downtown while neglecting the city’s troubled neighborhoods. Many Oakland activists sought to influence Brown to favor groups they felt were left behind by the mayor’s policies; what they found, some say, was a pragmatic though often inflexible leader. Running as a mayor for the arts, Brown promised to support Oakland’s artists. As his first term got underway, the mayor’s focus centered on the Uptown district, a portion of downtown between 17th and 21st Streets and running from Telegraph Avenue west to San Pablo Avenue. “The project involves thousands of people, which is just what that neighborhood needs,” Brown told the San Francisco Chronicle after details of his plans for the Uptown were revealed; the same article said that plans included a 14-acre development with 2,000 units of housing and some retail stores. Many felt that the new residents, as well as a newly renovated Oakland Fox Theater, would anchor a thriving arts district. Artists like Randolph Belle, who served as the vice chair for Oakland’s Cultural Affairs Commission into Brown’s first term, and as a convener for the Arts and Economic Development Task Force under Ron Dellums, heard the Uptown would become an arts district and opened up shop. But Belle found that Brown’s plans took longer to bear fruit than anyone expected. Arts promoter Randolph Belle in front of the Melonga Casquelord Center for the Arts. "I never would have thought I’d look back on Jerry’s days as good times," Belle said. Belle wasn’t the only person struggling to make it in the new arts district. The dormant Fox Theater didn’t reopen until 2008, and nearby residential development took longer than anticipated. Combined with the financial downturn in 2001, this meant that downtown boasted very little buying power. With few businesses other than medical marijuana dispensaries to draw people downtown, Belle said his gallery “died on the vine” in 2000. Patrick Lane, the staff member of the redevelopment division of Oakland’s Community and Economic Development Agency (CEDA), who was in charge of the requests for proposals in the 10K plan, says that two things slowed down the development of the Uptown, and the larger downtown area in general: “The economy and marketing.” Marketing the city to investors meant “changing the image of Oakland,” Lane said. “Half of the news stories about Oakland are like riots and crime, and a very small portion are the good pieces. It kind of slows people down in investing.” Combined with the lull in the economy after the 2001 “dot bust,” Oakland’s bad image slowed down the revitalization of commerce in areas like the Uptown, said Lane. But by 2007—the first year of new mayor Dellums’ term after Brown had headed off to serve as California Attorney General—Belle said his sense of being let down had faded as he saw the Uptown blossom as an arts district. Brown’s former watering hole Café Van Kleef now has plenty of neighbors. In the triangle formed by Telegraph Ave, Broadway, and 27th Street, today one finds the Stork Club, Sweet’s Ballroom and the Uptown clubs, the restaurants Flora, Ozumo and Luka’s Taproom, and the Fox and Paramount Theaters. Art galleries abound, although some have experienced more success than others. 21Grand struggles to stay open, and Ego Park had its last show in 2008. 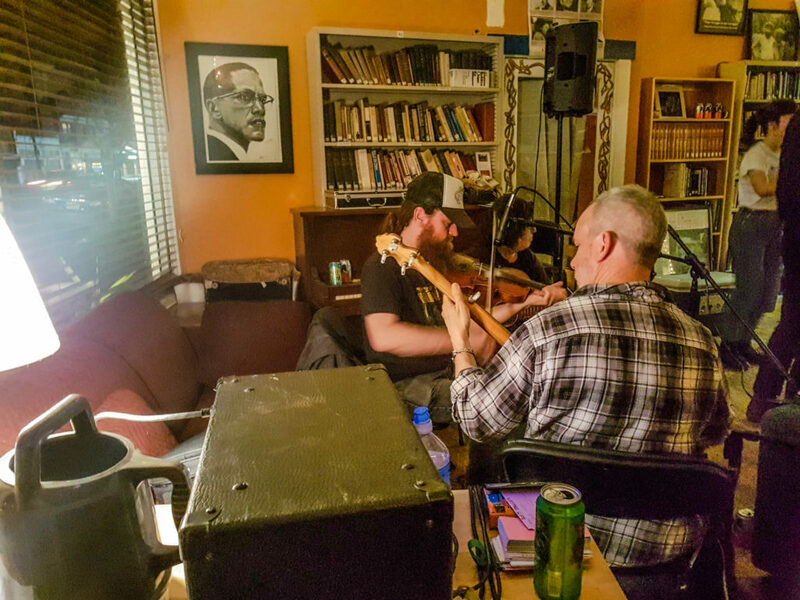 But the Rock Paper Scissors Collective sits at 23rd Street and Telegraph Avenue, with Mama Buzz and the Johansson Projects in its vicinity, and the monthly Art Murmur now attracts hundreds of arts patrons to several galleries downtown and beyond. “The Uptown that we know now was obviously what was envisioned,” said Belle. Lane says that despite setbacks from the economy and Oakland’s bad rap among corporate investors, things are looking up now thanks to Brown’s efforts. “The trends are that the better restaurants are leaving San Francisco and coming to Oakland,” said Lane. Touting his vision of a greener, more sustainable city based on a European model, Brown started his mayoral campaign with a draft of what he dubbed the “Oakland Ecopolis” plan. “I see Oakland as an ‘ecopolis’ of the future—a city that is both in harmony with the environment and in harmony with itself,” Brown told a Washington Times reporter in April, 1997. Once he was mayor, his administration launched the 10K plan, aiming to bring 10,000 people to live in Oakland’s downtown. By the mayor’s logic, the new residents would bring buying power to downtown neighborhoods, and a denser downtown would be more environmentally sustainable. As plans emerged for residential developments, it became clear that most condominiums and rental units would be set at market rate prices, which were fast on the rise thanks to the influx of young professionals earning salaries from tech companies in nearby San Francisco and the Silicon Valley. Forest City West Inc., a development and property management company based in Cleveland, Ohio, won the chance to build market rate apartments in the Uptown area with the promise of significant property tax rebates when the building was completed. Their proposal ultimately became the Uptown apartments, a 700-unit building that Forest City Enterprises built on an empty parking lot across the street from the Sears department store. The Uptown Apartments on William Street in Oakland. The three-building apartment complex features a gym, a communal lounge, and a pool and spa deck. But after locking horns for several years, advocates, developers and the mayor’s office reached a compromise. In 2004, affordable housing advocates signed an agreement with the Oakland Redevelopment division of CEDA, setting aside 140 affordable rental-housing units within the Uptown apartments. (For the Uptown, “affordable” meant that the rent couldn’t exceed 50 percent of the median income in Oakland.) The agreement also laid out the parameters for an 80-unit affordable housing building that eventually became Fox Courts, built at 550 18th Street behind the Fox Theater. Dennis said she is pleased with the affordable housing that emerged, but also said she wished that Brown had been more open to advocates’ opinions from the start. “It was a several-year organizing effort where we really were, unfortunately, fighting the mayor,” said Dennis. De La Fuente says the goals of the 10K plan were reached, if not during Brown’s mayoral term, then shortly thereafter. “A lot of [development] projects started after Jerry Brown left office. I think you can give him credit for those,” De La Fuente said. It’s hard to predict how Brown will take on housing issues as California’s governor, and whether his efforts in Oakland to develop a denser downtown, or his initial resistance to affordable housing, will inform his decisions in Sacramento. Spokesman Sterling Clifford said that developing fixes for the housing crisis would be a continued goal for Brown, but his campaign materials and remarks leading up to the election provide few details about his plan. The day after he was elected governor again, as Brown announced that he would continue to live in Oakland, he joked that he couldn’t leave his Oakland hills home until it was worth what he paid for it. As mayor, Brown tried to exert control over a school district that the mayor traditionally has little power to govern. His approach took two forms: changing the makeup of the school board, and opening two charter schools. At the start of his first mayoral term, the Oakland Unified School District was in financial peril. Superintendent Carole Quan was ousted over financial mismanagement in 2000, Brown’s second year as mayor, and the district faced a multi-million dollar deficit. In 2003, the state passed a $100 million emergency bond to finance the school district and appointed a state administrator to take control. After Quan’s ouster, Brown got into a standoff with the school board over who should replace her. Brown had appointed Assistant City Manager George Musgrove as the interim superintendent and was gunning to name him permanent chief—a measure on the March ballot would have given Brown the power to name the superintendent. However, the school board gave the job to Dennis Chaconas in February, before voters could approve the measure. 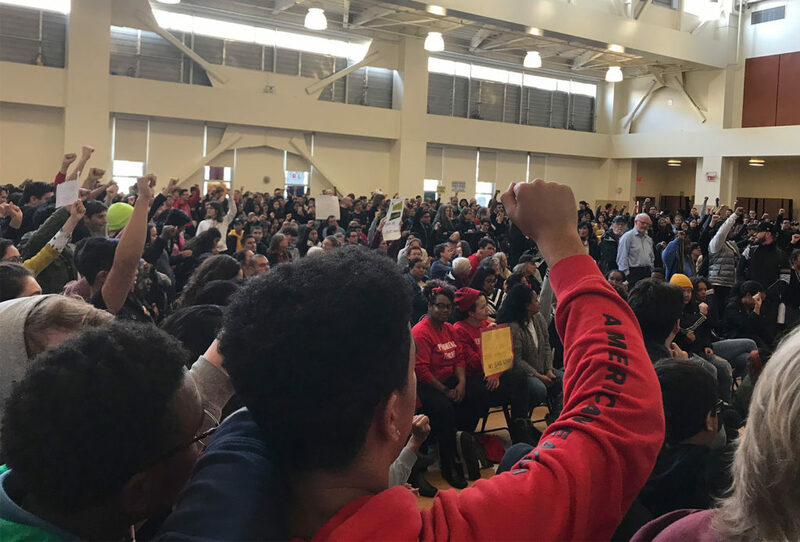 At that point, “Brown washed his hands of the school district, and that was kind of too bad,” said Liz Sullivan of Oakland Community Organizations (OCO), a non-profit that advocated for small schools during Brown’s tenure. “He felt that he didn’t have enough control to have an impact” on the board. In the early years of Brown’s tenure as mayor, OCO and the school board, among other organizations, advocated breaking large campuses into smaller schools, as part of what became known as the “small schools movement.” Sullivan said her group pushed a small schools policy, and Chaconas helped implement it, calling for 10 small schools in 2000. The policy broke up large schools, such as Fremont High, into smaller schools within the same facility. Proponents said that keeping students in small groups that stayed with the same teachers would improve academic achievement. Brown took a different approach by creating two charter schools that Sullivan says were meant to challenge the whole district to perform better. By partnering with the California Cadet Corps, an organization that bases its pedagogy on military training, Brown founded the Oakland Military Institute in 2001 at the Oakland Army Base. (The school later moved to North Oakland.) In 2002, the Brown-founded Oakland School for the Arts (OSA) opened in the Melonga Casqueulord Center, and eventually moved into the Fox Theater. The OSA makes its mission to prepare students for college while giving them “conservatory-style training,” according to the school’s website. Oakland's Fox Theater, reopened in 2008, sits in the middle of the Uptown district. The theater now houses the Oakland School for the Arts, whose students will perform "Bye Bye Birdie" there this December. Although Brown and the small schools advocates took different routes to pressuring the school district to change, Sullivan says that ultimately they worked in concert. “It was kind of the perfect storm,” said Sullivan. “He was pushing charter schools, and we were pushing for inside change.” Small schools, she said, were similar to charter schools in that they focused on individual students’ needs, but that they expanded this benefit to more students. The thought was, “How do we take that concept and take it to scale so it affects every school in the district?” she said. His 12-point education plan, published during his campaign, includes reducing bureaucracy, revamping the state’s testing system, and holding “schools accountable for outcomes, not issue minute prescriptions from Sacramento on how to achieve those outcomes,” according to Brown’s campaign website. What does Brown’s time as Oakland’s mayor reveal about the man who will once again lead the whole state? If nothing else, it shows the man loves an argument. The arguments aren’t easy to win, says housing advocate Dennis. “I think he’s tough to lobby, I think he’s tough to win over,” she said. “He was fighting it instead of trying to embrace the compromise,” she said of her coalition’s efforts to guarantee affordable housing in new downtown developments. Brown’s plan for creating jobs as governor focuses on developing a renewable energy infrastructure across the state. It follows a similar tack as his plan for Oakland, but instead of building a populous and wealthy residential zone to boost retail, he wants to require that 33 percent of the state’s energy come from renewable sources. The plan, detailed on the governor-elect’s website, calls for a “clean energy jobs czar” to implement a long list of policies that should reinforce this sector. De La Fuente also seems assured that Oakland itself will benefit from Brown’s return to the governorship. “In this game of politics, and everybody basically fighting for resources and revenues, I think that it’s going to be good for the city,” he said. 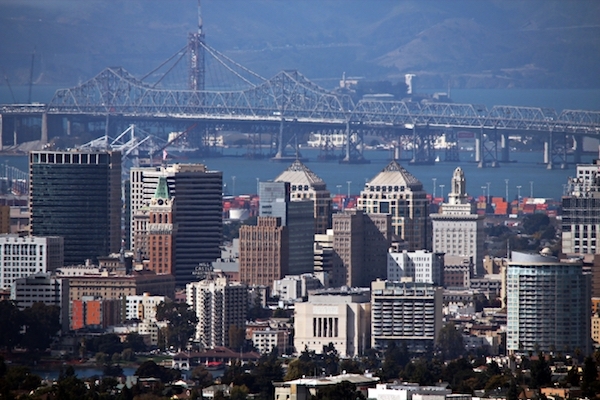 And despite the criticisms—that Brown preferred new, upwardly mobile professionals living downtown over its long-time working class residents; that he favored the downtown at the expense of East and West Oakland; that his arts district was slow to develop; that his charter schools only benefited the few—Brown’s popularity lives on in Oakland. To some critics, Brown’s accomplishments, such as the creation of some affordable units in new downtown housing and the flourishing of the uptown district, seem more praiseworthy now that the fight is over and the results are more clear. Even those who disliked Brown’s approach to Oakland seem to be willing to give him another shot—returns from the November 2 election show that 73.65 percent of Alameda County voted for Brown, many of them checking his name all over again. This story was corrected from a previous version, which incorrectly stated that Randolph Belle worked on Oakland’s Arts and Economic Task Force under Jerry Brown. Belle worked on this task force under mayor Ron Dellums. The previous version also said that Jerry Brown ran for president in 1982 and 1988, which is incorrect; Brown ran in 1976 and 1980, in addition to his run in 1992. The previous version also referred to Cafe Van Kleef as a downtown bar in the year 2000, but this reference has been removed because Cafe Van Kleef was not yet open at that time. Oakland North regrets the errors. Jerry Brown talks to the press from the 3rd Street warehouse office of his campaign spokesman. The office is around the corner from the headquarters of We The People, a commune founded by Brown in 1995. Arts promoter Randolph Belle in front of the Melonga Casquelord Center for the Arts. “I never would have thought I’d look back on Jerry’s days as good times,” Belle said. Oakland’s Fox Theater, reopened in 2008, sits in the middle of the Uptown district. The theater now houses the Oakland School for the Arts, whose students will perform “Bye Bye Birdie” there this December. Brown ran for president in 1982? Gutsy move, considering it wasn’t an election year….